The day after Thanksgiving usually marks the first day of Christmas decorating at my house. But yesterday, we got about 4 inches of snow here in Southeastern Wisconsin, so I say it's beginning to look a lot like Christmas! And when it looks like Christmas, you gotta put some decorations up, right? 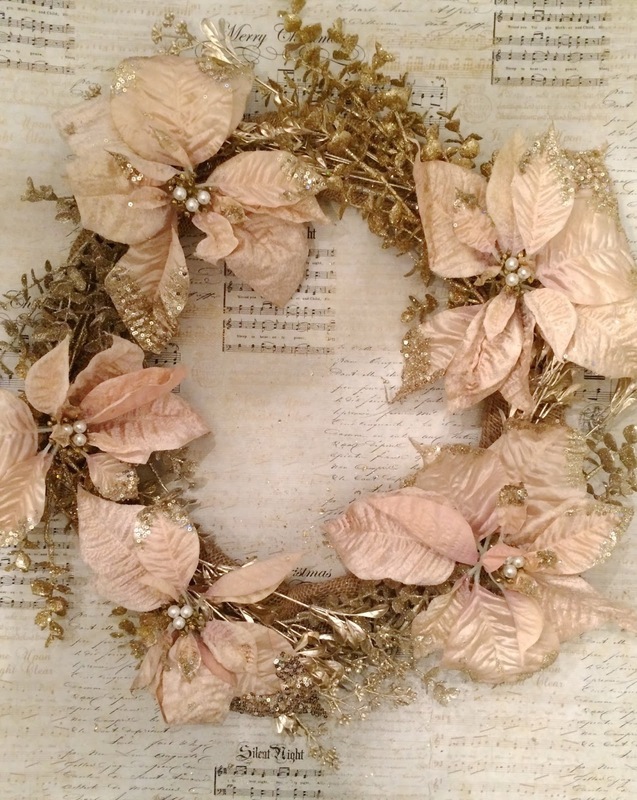 I knew I wanted to do a wreath in light shades to contrast against the dark grey wall of our living room (This one is going above the fireplace.). 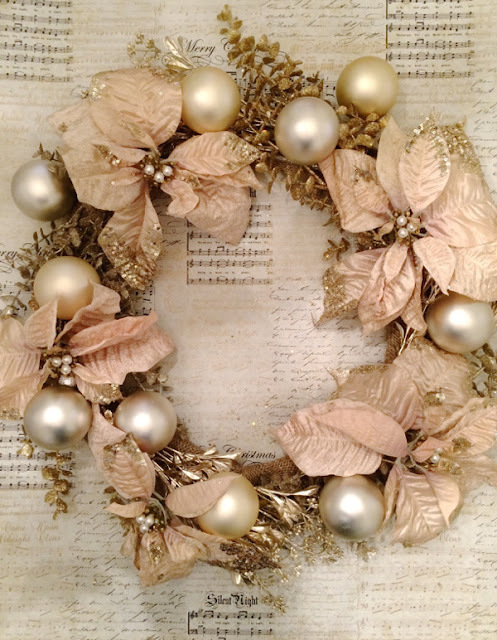 As soon as I spotted these beautiful champagne, gold, pearl and blush decorations at the craft store I knew they'd be perfect. In between sips of hot chocolate, I managed to complete the whole thing in about an hour. Not all the supplies were used, but it's better to have too many things to choose from than not enough! 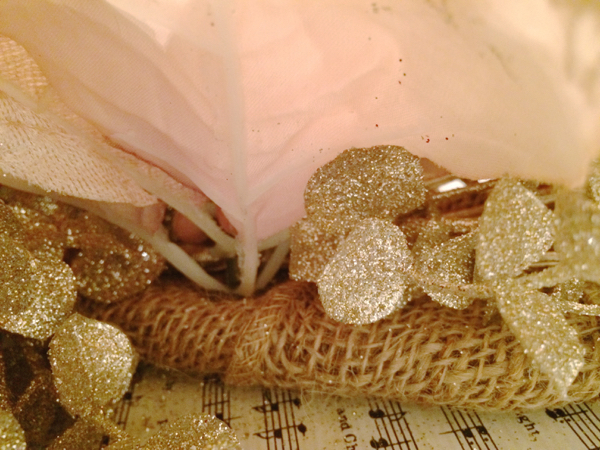 Since all the colors tie in nicely together, I'll use the leftover items on the tree and for garland. 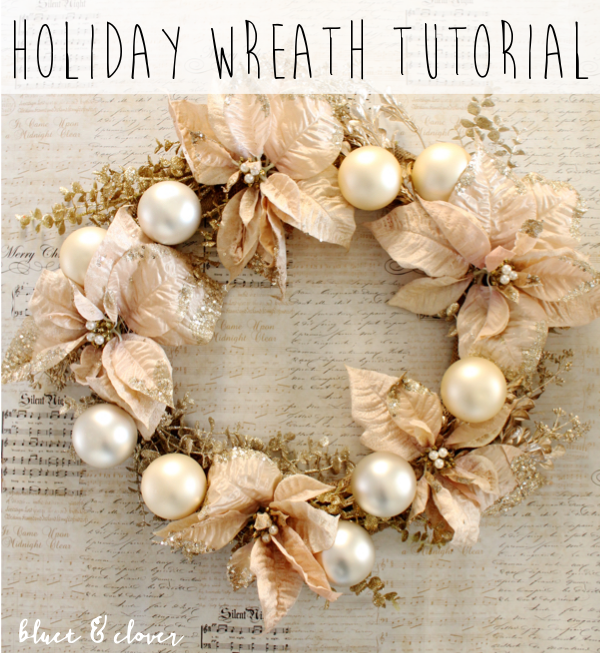 Here is a complete list of supplies for making this very same wreath. I got everything at Michaels and it was all 50% to 60% off yesterday. 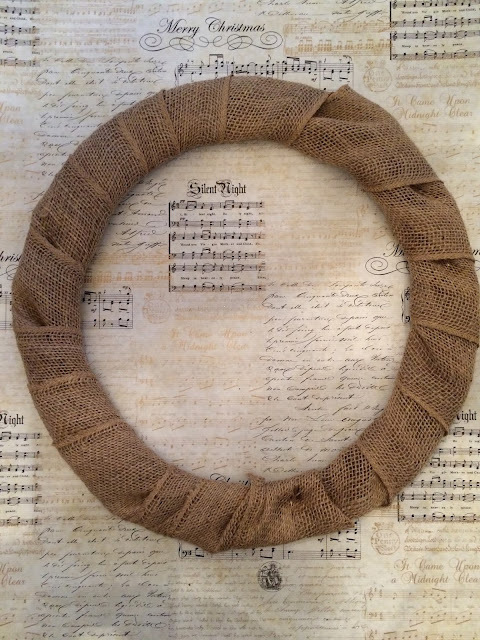 Excluding the wreath frame, wire, burlap ribbon and tools that I already had, I spent about $32. *I highly recommend using plastic ornaments. 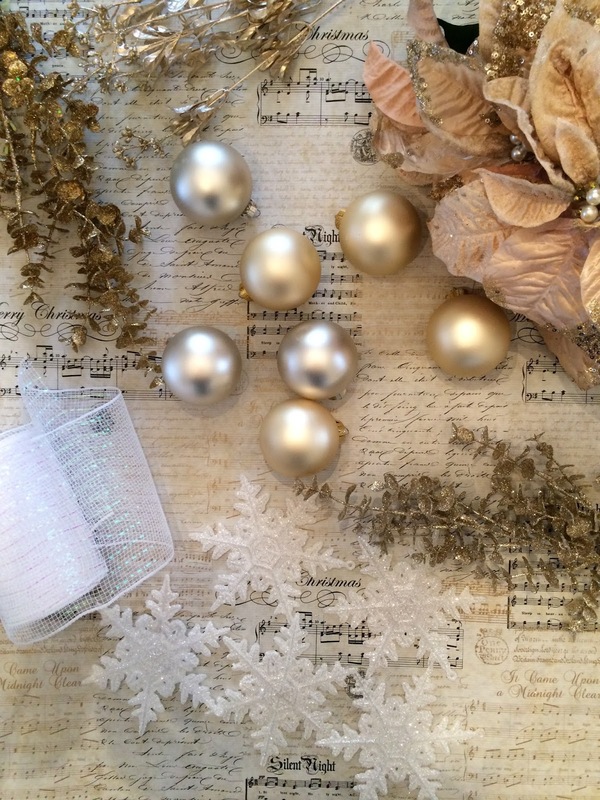 I used these glass ornaments because the colors were just too pretty! If you do go with glass, be extra careful. You may want to glue the caps to the balls as a first step. My caps slipped off a couple of times while I was attaching them to the wreath. 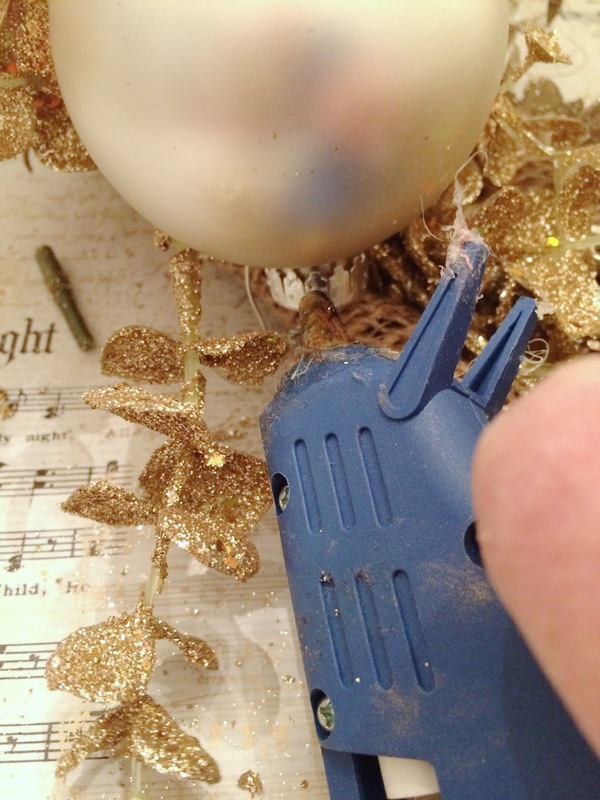 Also don't hot glue on the glass ball when attaching to wreath, only glue the cap (more on that later). Step 1: Attach the end of burlap ribbon to the wreath frame using floral wire. Step 2: Wrap the ribbon around the frame. 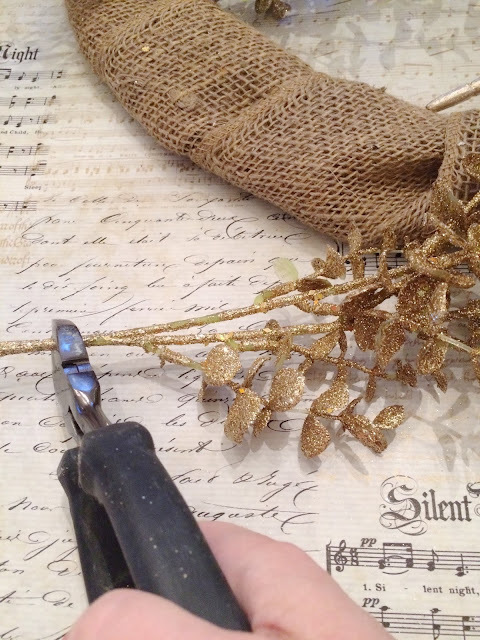 Step 3: Cut ribbon and attach the end to the frame with floral wire. 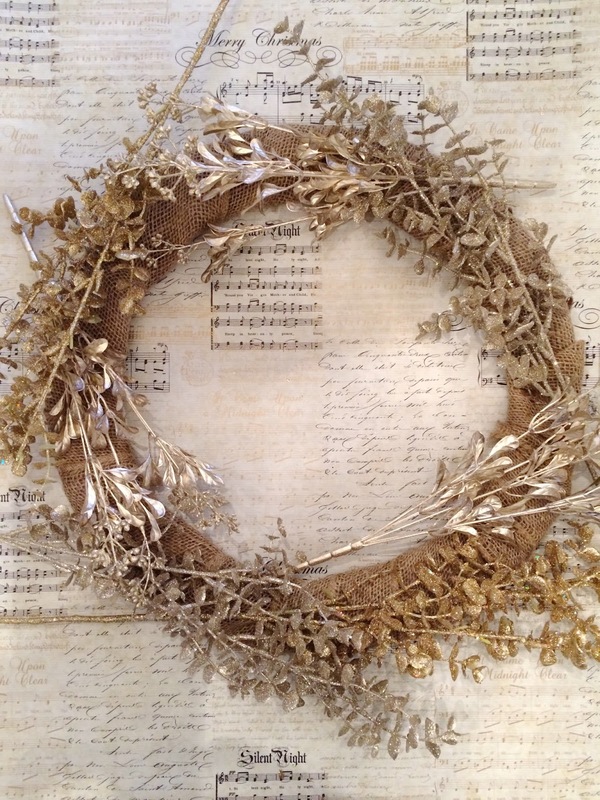 At this stage, your wreath will look something like this below. Step 4: Arrange the eucalyptus and boxwood stems around the frame so that there's a nice balance and most of the burlap is covered. You can cut long stems with a wire cutter (This takes a little muscle.). Or you can bend them and tie down to the frame with wire. Stems will be hidden underneath the leaves. That way, if you ever decide to take apart your wreath, you can use the stems in vase or for some other craft where stems are needed. Step 5: Attach stems to the frame with floral wire. 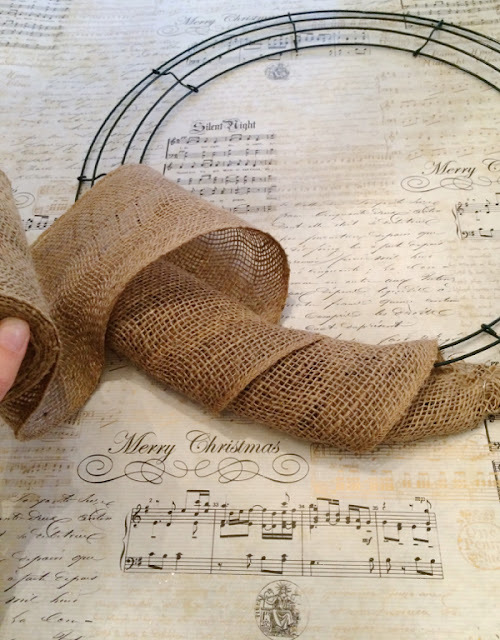 You make a little loop with about 3" of wire, poke the wire ends through the burlap and twist together on the back side of wreath. 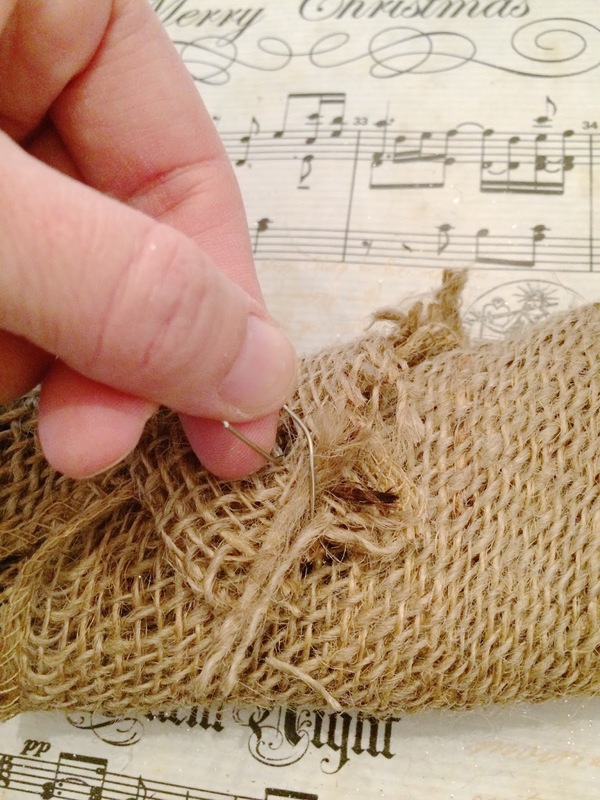 Make sure you are attaching to a wire in the frame and not just the burlap. 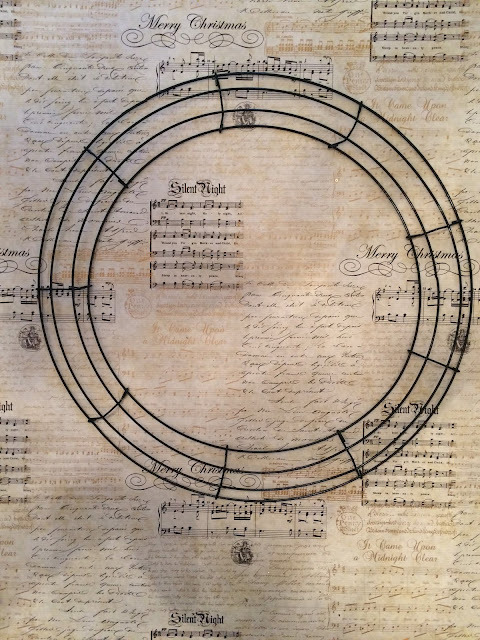 Bend and shape the branches so that they move in the direction of the round frame. 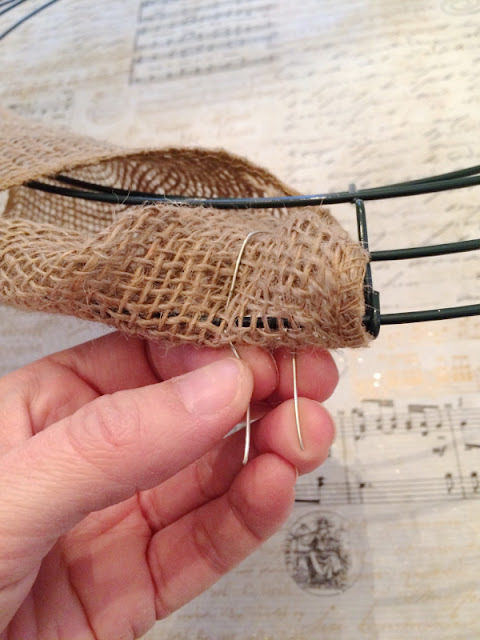 If bending them doesn't hold them in place, just use wire to attach to frame as needed. Step 6: Using wire cutters, clip poinsettia stems to about a half inch below the bottom leaves and arrange in a pleasing way on top of the wreath before gluing them in place. Step 7: Hot glue the flowers in place. Put a generous amount of glue at the base of the stem. 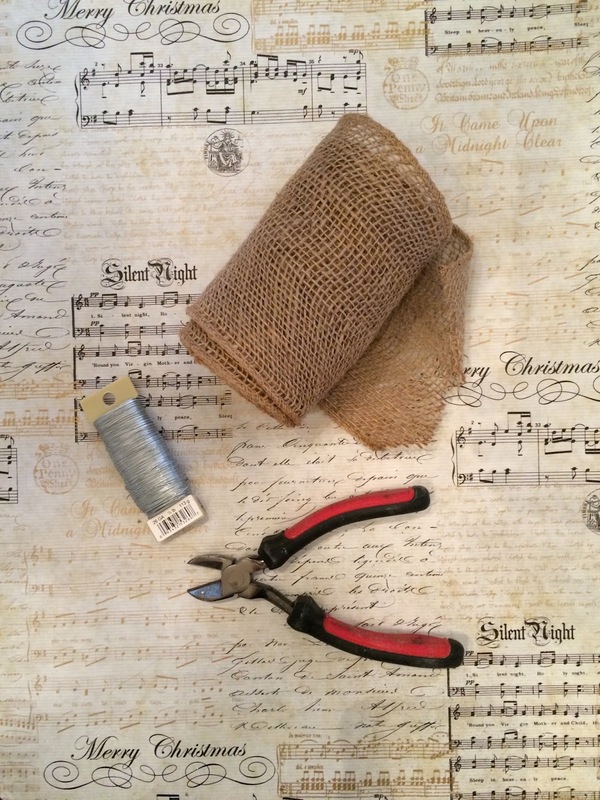 Make sure you press the stem into the burlap and not one of the branches. This will ensure that the flowers stay in place. 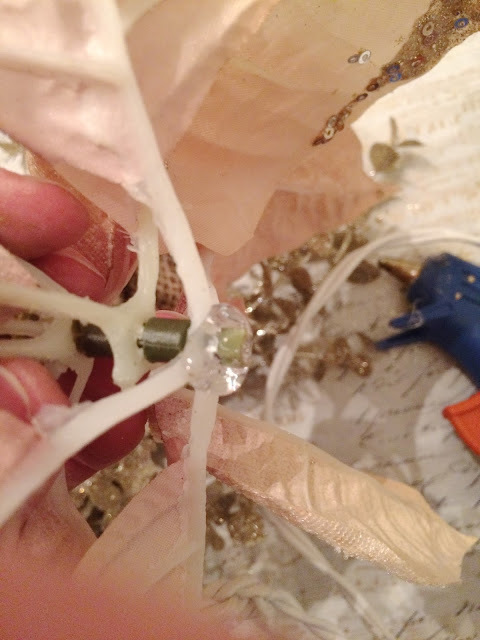 Hold down the flower for about 10 seconds while glue dries. Step 8: Now it's time to play around with the placement of the ornaments. When you have them where you want them, cut about 3" of wire and loop through the ornament. Attach to frame as you did the branches. 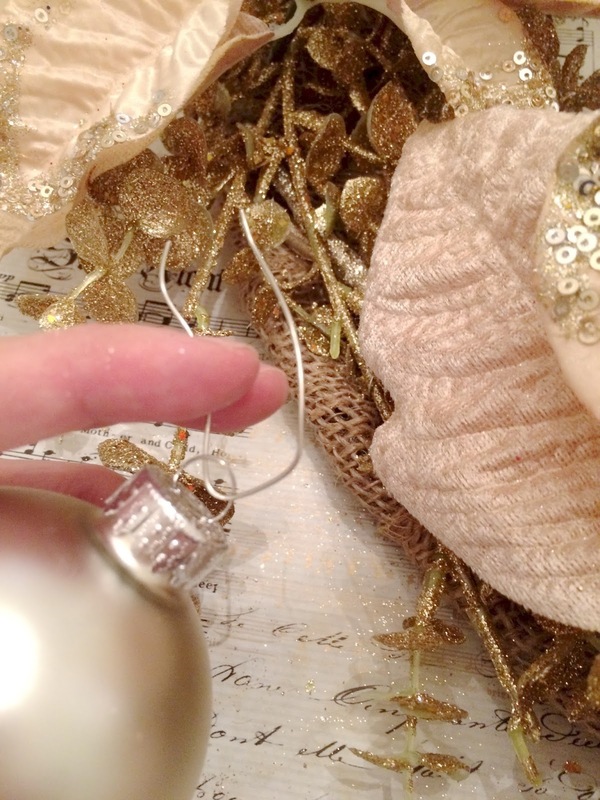 The ornaments are likely to dangle when hung, so use a glue gun to keep them in place. Do not hot glue directly onto the glass ball. They could break. Instead, apply a generous amount of glue to the cap and press in place. 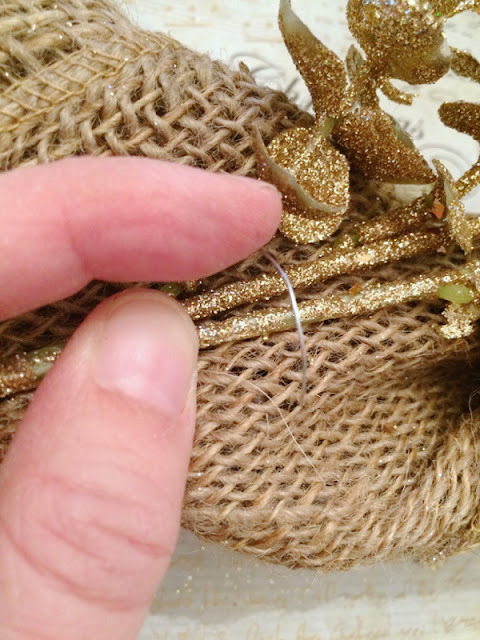 You can make a hook on the back of the wreath with some floral wire. Make sure to loop the wire through at least one wire on the frame. Now it's time to hang your wreath.